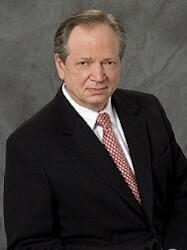 Don Kurasch is the founding partner in the firm. He was admitted to practice in Illinois in 1972, following his graduation from the University of Illinois College of Law. He limits his practice to civil litigation, including plaintiff’s personal injury, medical malpractice, corporate litigation, nursing home negligence, auto accidents, premises liability, FELA, products liability, and wrongful discharge. Don has won many millions of dollars for his clients over the years, including two recently litigated cases resulting in settlements of 7.5 million dollars and 4.8 million dollar, in addition to a trial verdict of $4.8 million. He has been a frequent speaker in the field of injury law over the years. Don was recently voted to the list of the top 100 trial lawyers by the National Trial Lawyer, and he has been named to the list of the top 5% of all Illinois’ lawyers every year since the inception of the selection process. Don has addressed the Chicago Bar Association, the Rehabilitation Institute of Chicago, union groups, and nursing schools. Don has been a guest lecturer in the Chicago Junior College system on the subject of Urban Law. Don was admitted to practice before the United States Supreme Court in 1977. He has been awarded the title of Advocate by the American Board of Trial Advocates. For many years, Don has been an invited member of the panel of arbitrators of the American Arbitration Association. He is a member of the Chicago Bar Association, American Bar Association, Illinois Trial Lawyer’s Association, American Trial Lawyers Association, and Illinois State Bar Association. Don received his Bachelor of Arts from Grinnell College in Grinnell, Iowa, in 1967. He was born in Oklahoma City, and has lived since childhood in Chicago. Don’s father was a labor union president, which Don credits for his love of fighting tough for the clients he represents.